For those that are inexperienced with the realities of “vanlife”, it’s easy to become smitten by the various blogs and social media posts that promote and celebrate this free and easy lifestyle. Don’t get me wrong, as long as you don’t mind roughing it a little sometimes and you have a love of outdoor activities, vanlife in it’s various forms will definitely be an enjoyable and memorable experience. But it’s really important to separate fact from fiction when you’re planning to make the plunge to buy a vehicle, convert it, and then travel around and live out of it. This is true even if it’s just a weekend escape vehicle, let alone go the distance like we did and quit your cushy, boring, overpaid job and set off without any plans or idea when or where we’ll be settled next. As we travelled around, met people and fielded comments online, we were often asked how much it cost us to buy our van and set it up as a camper, and also how much it was costing us to live and travel on the road. Many were surprised that we didn’t need to work as we travelled. Obviously some people haven’t quite worked out the secrets of saving money and being frugal yet! Hint: It’s not easy and you have to be disciplined. Riding a bicycle instead of driving a car for short trips and cutting out unnecessary consumable/materialistic expenses helps a lot! The day-to-day realities and challenges of vanlife will depend on your location, if you’re working on the road or not, what sort of vehicle you use, and how that vehicle is setup for maximum liveability and comfort. We made the decision to work and save hard for the year before we left, so that we would be financially independent and able to enjoy our trip without being forced to constantly search for an internet connection or mains power. We don’t regret this decision at all, especially as our Delica is effectively set up as a vehicle to live out of, rather than live in. The lack of internal ‘lounge’ space – being somewhere comfortable to sit at a small table inside the vehicle sheltered from the elements and insects etc, was a calculated decision based on our needs and space constraint realities. If you are planning to travel in a van and continue some form of online, income-generating enterprise, then we strongly recommend that you are conscious of the need for a comfortable, sheltered, interior space to do work, and the need for a solid, reliable internet connection and an ample power supply (both a large battery AND plenty of solar panels or a compact generator if you want to be off the grid most of the time). The need for extra internal space, internet connection, and power to travel and work on the road, the cost of setting up and maintaining your equipment will consequently rise proportionally to your level of creature comforts – so you’ll have to be sure that the work you plan to do will actually be worth it and be sustainable given the added expenses. 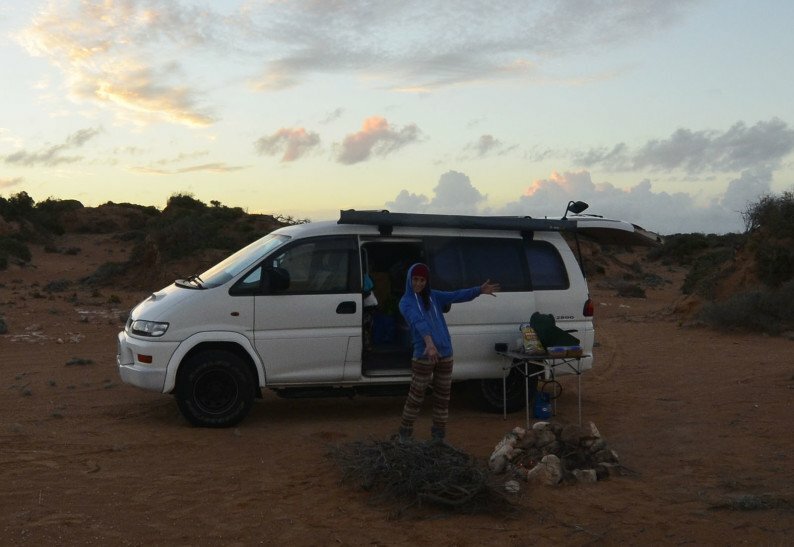 We documented most of our expenses incurred over a six month period as we planned and bought equipment and materials for the Delica and our trip. The expenses are in Australian dollars and it should also be noted that generally Australia is a very expensive country for consumer goods and materials compared to the USA and other countries – so keep this in mind. As far as we are aware, this is a fairly comprehensive list and record of expenses for average on road costs per month. Most vanlife-oriented online media often fail to take into the unavoidable expenses of servicing, repairs, insurance and vehicle licensing fees. Note that these costs are for two people travelling around Australia – the costs of food, fuel, park passes, servicing/repairs and so on will vary somewhat depending on region and number of travellers. Well, it depends. Given the above figures, it is definitely financially sustainable to travel for an extended period of time IF you have a basic source of reliable income, always locate free camp sites, and are prepared to do plenty of work yourself in terms of research, conversion and ongoing maintenance. In general, vanlife will be significantly cheaper than renting a small, basic house. In the area where we are temporarily living, it would cost cost around $900-950 per person each month for rent, food, basic vehicle costs, and utilities. We met a few couples and families while travelling who had managed to pay off a house, save money, buy an old camperbus/motorhome and fix it up, and then retire early to travel around Australia indefinitely. They lived a no-frills, simple lifestyle and earned a small but reliable and adequate income from renting out their property, interest from cash, and returns from investments. If you are planning to work while travelling it’s really important that you provide sufficient space to work and be productive. Even if you aren’t planning to work on a computer, it’s still invaluable to have a comfortable spot to relax after a long day outside or when the weather is foul. It really comes down to where you are travelling (will a small van or 4×4 vehicle be necessary), what the weather will be like, how long you are travelling for, how much comfort you need/want, and what sort of activities you want to do along the way. For example, we met and travelled with some international backpackers for a couple of weeks while we were in northern New South Wales. They had two rough, basic campervans between the four of them. The vans, held together by duct tape and other ghetto fixes, essentially just had a bed frame with a mattress, a water canister, a cooler box for food, and few storage boxes underneath. Sure, these campervans were extremely simple, but they were cheap (less than $3500), efficient to run, and they met the basic needs and budget of our new friends as they followed the well worn ‘backpacker trail’ from Sydney to Cairns (far north Queensland) over two months. For extended travel or working while travelling, we strongly recommend a larger vehicle with a lounge/office space, ample power supply, internal food preparation facilities, bathroom (or at least a private toilet space and outdoor solar shower), and a pop-top/high roof for comfort and ventilation. With these luxuries will also come increased upfront costs and on-road costs, so ensure you factor this into your budget. It’s definitely worth spending a bit more time, effort and money to have a vanlife setup that suits you and your needs, as this will increase the likelihood of you having a comfortable, hassle-free, productive and memorable trip!